As an individual investor and blogger I do what I preach. I have a dividend portfolio which consists of almost 40 individual issues, most of them dividend achievers or aristocrats. I often get criticized by readers for writing about stocks which many seem to have a low current yield, despite having a history of increasing in dividends. Those readers believe that finding a high yielding stock is the best income play for the long term. In other words stocks that pay over 8% but do not raise distributions are viewed favorably than stocks which currently yield 2%-3%, but grow their dividends consistently. The reason why I consider dividend growth investing a superior investment strategy is because it focuses not only on delivering a rising stream of income but also on total returns. To the untrained eye it might appear that investing in Abbott Labs (ABT) or Johnson & Johnson (JNJ) is a poor choice, especially since these companies yield 3%. The main advantage of these companies of course is that they have always paid a low current dividend yield, but have grown their payment in the process. The stock price typically adjusts upward, which decreases the current yield to a normal range. 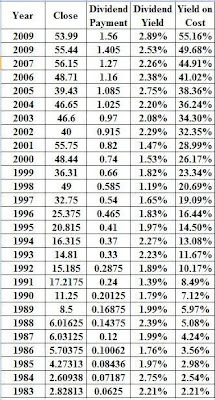 Thus these dividend growth stocks deliver total returns which high yielders cannot match in the long run. In addition to that the rising dividend payment increases the yield on cost on the original investment. Let’s illustrate this with an example. Abbott Labs (ABT) is a dividend aristocrat which has raised distributions for 37 years in a row. It yields 3% right now, but has a ten year dividend growth rate of 9%. At this rate the company would double its dividend every 8 years. The growth has slowed over the past decade however – since 1983 the dividend growth was almost 13.1% per annum. The stock yielded 2.2% in 1983, which was hardly under the radar of any yield chaser. In fact the current yield at year-end for Abbott fluctuated between a low of 1.20% in 1998 and a high of 2.89% in 2009. The visionary investor who purchased Abbott at the end of 1983 achieved a yield on cost of 10% in 1992 in addition to holding onto a five-bagger. Twenty six years later this investor would have achieved a yield on cost of 55%, which is something that even the highest yielding stock out there cannot match. An investor in a high yielding stock in 1983 would have most likely kept on receiving a high current yield for a long period of time. The main issue with this scenario is that the purchasing power of the flat dividend payment would have been cut in half over the past quarter of a century. Similarly an investor in 30 year US Treasury Bonds would have kept receiving the same amount of income each year. Check my analysis of Abbott Labs. Other companies which have a long history of raising dividends while also delivering a strong dividend growth, plus being attractively valued at the moment include Johnson & Johnson (JNJ) and Clorox (CLX). Johnson & Johnson (JNJ) has raised distributions for 47 years in a row. The company has achieved a 10 year dividend growth rate of 13.30%. The latest dividend increase was 6.50% in 2009. The dividend payout ratio is at 43%, which makes it adequately covered. Check my analysis of the stock. Clorox (CLX) has boosted dividends for 32 consecutive years. The company has achieved a ten year compound dividend growth rate of 9.60%. The company last raised its payout by 8.7% in 2009. Its dividend payout is at 50% right now, which means that the dividend is well-covered from earnings. Check my analysis of the stock.